"See Our Light, Free Thyself"
During Elder Dragon rule of Cambria Ardmore was referred to as the “First House” as they pledged allegiance to the Elder Dragons to maintain a privileged status as the ‘favored’ human kingdom under serpent rule. This decision undoubtedly sowed the seeds of distrust between the other houses and Ardmore, which still somewhat lasts to this day. However, Ardmore is quick to remind others that is was their wealth that fueled the revolution against the Elder Dragons to help free humanity from the clutches of Dragon rule. Following the revolution Ardmore made political and military decisions that did little to help the distrust the house faced from other kingdoms, such as attacking neighbors out of mere spite or allying with dark magic practitioners for territorial gain. However, their eventual alliance with other houses to help defeat the armies of the undead, in what is now known as the great Necromancer Wars, by summoning a God of Light known as Lord Lucent vastly improved their relations with other kingdoms for a brief period of time. Ardmore is a highly influential house that has replaced its traditional royal rule with a High Priest/Priestess class known as the Lucentites. The Lucentites are lead by a High Religious Ruler known as the Alfatikan who is believed to be the one true channel to the power and light of Lord Lucent, a God who appeared at the Undead Necromancer Wars of years ago. Ardmore keeps Lucentite activities under a veil of strict secrecy, even from Ardmore’s land-holding citizens. However, this has not been an issue as Ardmore citizens do not question that their house is tuly worshiping the one True God of not only Cambria, but the entire world. Ardmore proclaims that its mission is to spread the light. Ardmore Citizens: the Lucentites approve of using traditional Ardmorian culture and traditions to keep favor with their people. The traditional colors of Ardmore are hunter green (like the grasses of the rainy Western Expanse), plus gold to honor the wealth of their gold and gem mines. Ardmorians are never too shy to adorn themselves in gold and gems as a display of the wealth of their mines. The Lucentites portray themselves as perfect and pure, and believe it is inevitable that Lord Lucent will one day be the official God of all the peoples of the world. Ardmore citizens may still often use traditional snake symbolism in clothing and jewelry, as to reflect their past dealings with dragons as a favored house of long-lost ancient times. Ardmorians also have a fondness for roses, as their lands are mine rich but lacking fertile soil. Few flowers can grow off the windy and rainy cliffs of their western land beyond the Endwall Mountains. Their resources are gold and gems, which are not easily found anywhere else in Cambria. This makes Ardmore a house even rivals must consider doing business with. The official religion in Ardmore is the following of Lord Lucent. Followers of Lucent believe that he was a magical knight who helped create the land of Cambria by protecting it from evil in prehistoric times. His power was beams of light that he could cast down from the skies to defeat all forms of darkness. During the war against the undead the King of Ardmore was said to have become Lucent himself, and with the power of the divine was able to push back the soulless hordes. Whether this be truth or tallstroy, Ardmore now believes it is the rightful home for the gateway between everyday life and “the light”, which is the eternal gifts Lucent can bestow on anyone who follows the light. Although the Lucentites allow traditional Ardmore colors and symbolism for their citizens, who choose to honor their history, all other religions have been strictly banned, but for the following of Letitius, the God of the mines, as the Priest class wants to keep favor with the rural clans that still willingly work in the harsh and dangerous mines. However, any defacement or defaming of the Lord of Light is punishable by public shaming, imprisonment or even death. To properly be graced with the eternal protection and power of Lucent, which spans both the living and the afterlife, a worshiper must pledge themselves to a Lucentite, who in turn, will connect that new worshiper in spirit to the Alfatikan, the only pathway to Lucent. The Lucentites take their throne within the Gold Citadel in Caer Orynth -- the new Temple of Lord Lucent. They have a hierarchical structure of governance that has no separation of church and state, as the “Temple of Light” is single-handedly responsible and empowered to create and enforce the laws of Ardmore (laws that may change more than the weather itself). The Lucentites wield great power as they can justify any law or action by proclaiming that it was commanded by Lord Lucent through the Alfatikin. Ardmore has a large standing army they call the Lords of Light. This army has made the realm of Cambria nervous as Ardmore, somehow, is managing to grow the numbers of their army very quickly, defying all odds. To many outside of Ardmore, their army appears less of a defensive force and more like potential crusaders. The Lords of Light will wear a silver cloak into battle that covers their entire body and few witnesses claim they seem to be able to fight on after sustaining deadly kill strikes. With respect to magic, Ardmore’s stance on the issue of dark magic is baffling to the rest in the realm. Although they proclaim to be the bastions of light and purity, they have yet to agree to outlaw the practice of dark magic. This contradiction concerns Cambria. Game Disclaimer: this information can only be revealed to members of team Ardmore pre-game. For Lucentites: flowing white and/or silver gowns, capes, suits etc. For traditional citizens: hunter green with red and/or gold accents, these colors are still revered in Ardmore, along with snake symbolism. Why does Ardmore make other Houses nervous? Ardmore makes other houses in Cambria nervous for a litany of reasons. First, Temples have been built to Lord Lucent to commemorate in each kingdom, leading other leaders to fear that Ardmore is on a conversion quest. Additionally, the original followers of Lucent view the new Lucentites as a religious sect bent on power and not religion. The original Lucent followers proclaim that the religion was egalitarian, without a class structure and with no political agenda beyond protection and wellness for all people. Whereas the Lucentites are feared to be manipulating the religion for their own purposes. Importantly, Ardmore has taken sole responsibility for eliminating the remnants of the long-lasting undead army that was encamped in their southern lands following the Necromancer Wars of years ago. The fact that Ardmore has accepted this “generous” role of cleaning up the undead has been a bargaining chip to leverage other houses to not question their private practices. Any objection to Lucentite rule may be cause for Ardmore to allow the undead to venture into other regions of Cambria. Before the arrival of the Elder Dragons those of House Helfarian were renowned for the mounted charge of their heavy cavalry. Once humanity was enslaved by the Edler Dragons their horsemen were turned into heavy laborers and their chargers became draft horses. They bore the weight of their servitude stoically, hiding their weapons and armor in the mountains, awaiting a time when a rebellion would succeed. Indeed, the people of the north have memories longer than their winters. When the war arose, the Helfarians were the first to answer the call and their brave armies were the first to take on the Elder Dragons. Today the people of the north are a close group of clans, sometimes united but sometimes not, who favor human ingenuity over superstition. The Helfarians have witnessed far too much from the past to trust other houses too quickly. Over the past generations the Helfarians have done what they believe is best for Cambria, always being first to face off darkness from any direction. Facing off outside threats has been an easy choice for a Helfarian, no matter the danger involved. Therefore, to a Helfarian the greatest challenge has not been external, but rather from within. The north has always faced the issue of being divided on the question of magic. Some in the north believe magic can be harnessed responsibility, while others do not. This is not a political issue, but a generational one. There have been multiple opportunities for clans to cure this divide over the years but this wound has yet to be healed. For a century the Helfarians were making magnificent strides in technology and innovation, whether it be steam engines, war machines, new ports and other advances that would have propelled the north out of the dark ages of ice and steel into an industrial renaissance. However, recently disaster struck. A massive and towering laboratory in the Northern Reaches, the ultimate pride of the north called the Tubaist, was designed to harness electricity. However, during its first activation Tubaist exploded causing massive destruction and environmental change in the north. It’s remnants diffused into the air and became particles stuck in the icy atmosphere, blocking the sun from appearing in spring and summer for an entire year. It was said that it was so dark one could only feel fire. The Tubaist explosion resulted in two massive consequences, first it set Helfarian innovation back significantly, yes some of their technology remains but they now are forced to retrofit their creations with parts from other damaged tech. They have resorted to mad-scientry for survival, as if all that was new and promising is gone. However, this is a feeling those in the north know well and it seems that the Helfarians are destined for their greatness when times are toughest. The second consequence of the explosion is that it opened up a cave holding the original burial ground of the Helfarian army that battled the Elder Dragons long ago. In Helfarian traditional fashion the blood was these fallen was saved, a red liquid that, if consumed, could bestow enormous power to the drinker. In order to honor their fallen warriors of generations past they ritually save a vial of blood from a brethren who have fallen in battle. Usually, that vial will be carried by a Helfarian until their own death. They are passionate about innovative weapon design to the point of fetishizing novel and creative weapons, always inventing new ways of striking fear into the hearts of their enemies. Helfarians also enjoying tinkering with se team and coal powered technology, always thinking of how they can bring humanity out of thage of steel steal and superstition and into the age of machines and reason. However, with the recent catastrophe the efforts to recommence technological innovation has been put to a halt. Despite recent setbacks, the north has always been rich in energy reserves, such as oil, gas, coal and lumber, resources that other kingdoms desperately need and pay handsomely for. The stoic Helfarians have long turned away from the religious “superstition”, as they term it, of other houses. After the revolution that vanquished the Elder Dragons, anything connected to dragons, magic or old human ways was rejected. While the rest of humanity turned back to past beliefs, the northerners set to understand the laws of nature and craftsmanship. From these pragmatic principles, they learned how to create new forms of early industrialization. Yet, many in the north believe that observing natural law alone to be passionless, it can solve material problems but it cannot satisfy the grander questions of one's soul? Therefore, many in the north still hunger for a meaning that is other worldly. These Helfarians, in contrast to the wishes of the majority of their people, continue to explore the power of magic in the Everwood Forest. Due to heavy losses suffered in the revolution against the Elder Dragons, the Helfarians were forced to adopt a seniority succession law that still holds true to this day. The oldest remaining member of the noble house inherits role of Queen or King. The High Ruler of the Helfaria holds the Iron Citadel, a towering beast of a castle. However, the politics of the north are not as simple as the top-down ruling structure found in the east and west. At times, those who hold the Iron Citadel do not necessarily have the support of all the regional clans. There are always communal issues to deal with in the politics of the north. Never shying away from a fight, unlike the other houses where there is a line between those who have taken an oath for a "military life" versus a citizens life, most people in the northern clans are trained and ready to take up arms when called upon. The Helfarians have a battle-hardened army with special Dire Wolf units. Living in the harshest and most unpredictable of lands, their military is as much at war on the home front against new monstrous threats as they are against other forces. Additionally, it’s well known throughout Cambria that the subject of magic has always been debated in the north and remains divisive subject generation to generation. Some in the north believe magic should be banned while others practice magic secretly and unmonitored. Game Disclaimer: the current issues facing magic of the north is material that can only be known by Helfarian team member pre-game. With the catastrophe of the Tubaist lab explosion and the resulting devastation felt across the north, the clans face dark times. But dark times are what they are indeed accustomed to, and are often when the Helfarians have their finest hour. Daylight is limited and innovation halted. But, the wise know that with every loss there is an opportunity for a gain. The explosion opened a cave that houses an ancient Helfarian burial tomb. The tomb contains a machine that processes the blood of the ancient warriors, a machine of legend called the Gluasad. Legend speaks that if someone drinks the blood processed by the Gluasad they will either immediately die or, will become a warrior with enormous valiant power. However, legend also speaks that the tomb was hidden and buried forever because it contains a pathway to the inner core of the entire world, and any opening of this core could open a passageway for the unknown. Game Disclaimer: only a Helfarian team member will know what’s in the cave pre-game. Why does Helfaria make other Houses nervous? Although other kingdoms of Cambria will not admit it, destiny has it that the people most fit to deal with the volatility and darkness in the north are those who inhabit it, the Helfarians. They carry “the Greatest Weight” of these harsh lands. Once again something is awry, albeit the Helfarians through mistake (or some say sabotage) caused an explosive catastrophe, but by no means did they predict the outcome. The north may be the least fruitful of lands, but many have said they are the “most full”, full of mystery and terror only the clans of the north are fit to face. This is what makes the rest of Cambria nervous, word has spread of this newly discovered ancient and powerful ‘blood’ that Helfarian warriors are drinking to become superhuman in power, but they are not leaving the north. There has been little word from the north, not even a single emissary in months to Castle Bryn Mawr. This has other houses worried that something is once again wrong in the Frost Moors. "True Blood is Royal Blood"
All roads lead to Lancaster, an adage that stands at the heart of the House’s philosophy. The eastern lands have the easiest passes and the best roads, and sea trade begins on their shores. It takes a deft hand to handle the intricate politics of the most fruitful land in Cambria, and the blue-blooded Lancasters play that role to perfection. Unlike the rest of the Houses, whose noble lines were destroyed during Elder Dragon rule, Lancaster hid its line away, posing as peasants for centuries. However, each heir was raised with the weight of noblesse oblige upon them. The Lancasters have a saying that “there is a difference between wealth and nobility.” To the Lancaster, true nobility is worth more than all the gold in Cambria. Lancaster has managed to grow its influence and power over the past generations through politics and planning. Unlike their historical rivals, when the Lancasters make bold moves they do so with extreme calculation. Whether it be marrying into other house’s royal families, striking deals with dueling nations, or finding allies to help fight their own wars, House Lancaster has always managed to maintain their royal prowess. Even when their own citadel was damaged in the great magical wars, a strike to the pride and prestige of House, they managed to rebuild and reassert their influence in the stylish manner they are infamous for. Are they indulgent? Yes. But that is counterbalanced with the fact that it’s as if one who is born a Lancaster is born with eyes in the back of their head. The Lancasters expected new times to threaten their traditional royal way of life. With a stern class system between those with royal blood and those without the House’s influence could be challenge by voices who now question the righteousness of absolute royal rule. The family fears that new political movements in Cambria may result in the Lancasters being challenged by their own people, who for centuries believed the Lancastrian motto that if one has no royal blood entrust those who have. Second, with the demolition of the Trading Post, the Lancasters own trade operations are now more publicly accountable to the international law and treaties of Cambria. The days of profiteering are over. Finally, the House must now confront its greatest fear, that its royal lineage is not reproducing well and the original royal bloodline is beginning to fade. Word is that a secret coup was conducted in Lancaster, one that will suspend all treaties with other houses, and even more drastic, the new rulers paid off a well equipped and hardened mercenary army from the former Clan of Yarrow to join the army of the Lion Mane. These allegations should not be a shock, as fancy they may appear, Lancaster will never abandon their bloodline privilege without a fight. By far the most fertile Kingdom in all of the realm, the Lancasters love to showcase what they possess. They often bring plants and flowers that naturally grow throughout their lands (mostly to annoy other houses). They are also collectors of anything exotic, as they operate the main port in the realm. Lancasters possess spices, textiles, antiques, and exotic acquisitions, and others throughout Cambria will pay handsomely for their goods. The Lancasters own the Eastern Plains and fertile Danan's Cradle, plus they operate the largest port in Cambria. Their open territory features few natural defenses but a Lancaster scout can see an enemy a few days march away. They are not easily surprised. They live in the Ivory Citadel, a home not as massive as the other capital castles of Cambria but is all the more beautiful. The reflective beauty of their citadel in the sunlight has said to have made emissaries cry upon first sight. In a realm with many scars, the Ivory Citadel can appear as if one is walking to heaven. Lancaster lands are rich in food, herbs and fresh water resources, they would be able to feed all of Cambria if they wished to. Born of the love of their bountiful lands Lancastrian beliefs tend to focus on bounty and fertility. Their practices of ancestor worship have been handed down from generation to generation (formed during those harsh times when the nobles of the House were forced to hide away from the Elder Dragons as peasants). Nobles maintain shrines to their beloved ancestors, espousing the virtues of their departed kin and largely erasing and ignoring their failings. Even the common folk trace their lineage to some long dead noble relative, revering them as a touch of lost nobility that they may someday hope to emulate. Sometimes couched as “learning from the past,” the philosophies of long-dead Lancastrian predecessors remain pervasive within daily life. Many nobles affect behaviors, foibles and sometimes even flaws known to have been present in members of their lineage, while commoners quote catchphrases used by their ancient rulers. Naturally, as lineage is important, so is fertility. Many outsiders claim that their obsession with fertility is just an excuse for romantic excesses, but the Lancasters know that true pureblood royal legacy can only be secured by a strong lineage. As a peoples defined by nobility and bloodlines, naturally, Lancastrian succession follows primogeniture, though it ignores gender in favor of “Strength of Blood” which is a hotly debated topic within the nobility. While a King or Queen’s direct children almost always inherit the wealth and lands of their parents in birth order, occasionally a claim can be made by a lower born child to have “stronger blood,” attempting to demonstrate that the spirit of rulers past has more thoroughly inhabited them. This can lead to all sorts of interesting political entanglements as various factions attempt to prove the strength of their chosen pawn’s blood. Fortunately, politics is the strong suit of the Lancasters, and this is good practice for when they must pit their wits against the other houses. Although the Lancasters traditionally possessed an efficient and well lead military force, their strategy has mostly been known as "mercantile over might". Priding themselves on politics and espionage, they've often won a war without winning a single battle. However, recently things have changed. With the defection of an ample number of Yarrow units to Lancaster they now pose one of the largest armies in Cambria. Paired with their resources to tain and purchase materials for their army, Lancaster now is considered a house of military might. They also have special units of magical lion calvary that are renowned for their brave and powerful battle charges. The Lancaster proclaim that they will agree on an ordinance to outlaw dark magic. However, they have yet to formally do so. With the news of the troubles facing the royal family having made its way to their citizenry the House has pulled rank in a way never before seen in recent memory. The Lancasters have instilled a curfew on their peoples and are closely watching and regulating the actions of the commoner population. The Lancasters believe that as long as they can keep their lands bountiful and subjects satisfied they can bide enough time to address their internal issues. However, seeds of doubt are beginning to form and for House Lancaster its a race against time to bring the old ways back to repel the new. Game Disclaimer: there have been massive changes in the House that only Lancaster team members can know about pre-game, these changes may send shockwaves through Cambria. Medieval fantasy formal attire, dresses and gowns, medieval princely attire, but they're also quick to "get comfortable", so no shock to see a Lancaster wearing something more seductive, even to peace summit! Why does Lancaster make other Houses nervous? For generations House Lancaster has been known to value culture and the arts more than pure power and dominion over others. Historically they would defend their home and help allies in peril but were never known to be ones to put pleasure aside for the sake of vast conquest. However, there is one thing that the Lancaster will fight for, no matter the cost, and that is their royal blood and lineage, which to them is sacred and god-like. Now possessing new rulership (who has yet to appear publicly) and a massive army of both Lancastrian knights and battle-ready mercenaries, the realm indeed has great concerns over what drastic steps the House may take to maintain their long-lasting royal status. The newest House in Cambria will be the first to correct one who dares calls them a ‘House’. Born of a union of a house and a mercenary faction, Wyndon and the Brothers of Yarrow, the fortress of Sadathea, that once stood as the bastion of protection against the Draconians for a thousand years is now the first official Republic in Cambria, and this makes Sadathea a threat to the traditional royal house and clan-based civilizations in the realm. The Republic of Sadathea stands a symbol of freedom, hope and self-made destiny for all people of Cambria, and this makes other royal courts nervous. Certain mercenary armies and leadership of Yarrow and the volunteer conscripts and oath-takers of Wyndon agreed upon a natural union, where a constitution and republican set of laws would be enacted as law for those who sought freedom. The republic will welcome anyone who agrees to the laws and code of Sadathea and has the skills and work ethic to be an asset to society. The elected leadership of Sadathea knows that change comes slowly, so they are too wise (and by no means in a position yet) to challenge the wealth and armies of the other royal Kingdoms. However, their advancements in law, trade, and commerce have made Sadathea a valuable neutral partner to the other houses. The new government chose the symbol of a rising eagle over chains to represent the individual freedom rising from the shackles of absolutist rule. The tone of the shield is that of the earth and the colors of the eagle represent and homage to Yarrow. As discussed in the costume section below the people of Sadathea do not dress with a certain code or color scheme as royal houses do, they rather dress in alignment with their profession. Similar to the societies that gave rise to the republic, aspiring citizens will pledge an “allegiance” to Sadathea vowing to abide by the democratic rule of law and the commitment to egalitarian values. With that said, the citizens of Sadathea have often joined the republic in search of upward mobility and a better life than found in their homeland, so the movement to spread republican forms of government in Cambria has been slowed by its competing commercial desires. This can mostly be blamed on Yarrow’s influence and roots in putting as much value on wealth earning and strategic deal-making as the tough work furthering idealism. Having positioned itself as the new center of trade in Cambria the dream of Sadathea will be challenged by its own monetary desires. The former seat of House Wyndon, that strictly abided by its vow to be the first line of defense for Cambria for a thousand years, the republic is set in a quagmire of a region in the southern lands north of the Krag and the lands of the Draconians where swampland meets fire, steam, and sand. Nothing grows easily down south and there are no seasons. Wyverns and other serpents quickly transition from being cute creatures of interest to annoying pests. Additionally, without the benefit of the natural resources of the north, east, and west the citizens of Sadathea have to master law, trade, and education as a means of sustaining their economy. However, they are able to mine metals during the brief cooler winter months (but it never gets cold in the south). The fortress itself is the greatest asset of the southern lands. Less of a traditional, impregnable fortress of say the Iron Citadel of the north, fortress Sadathea is more of a weapon, a trap to be used against invading armies. A unique design of a myriad of walls and gates, those bent on conquest have learned that taking Sadathea is not the feat, it’s keeping it. Sadathea has seen many of an army transition from conqueror to prey once the inside of the stone walled matrix. Wyndon were masters of fortress and that wisdom has now been imparter to the new republic. The republic keeps matters of religion simple: all faiths are tolerated if they do not impinge upon the rights and happiness of others. There is a clear division between “faith and the laws of the republic”. This has resulted in a very diverse population. To accommodate this diversity the republic has established multiple temples of Universalism that proclaims that all faiths, if studied closely, have similar structures and patterns and that can be appreciated and accepted, if no harm is brought to others by their practice. The republic would pay interest on monies invested into its bank by other houses to maintain the republic’s existence by offering financial incentives to other houses. The republic believes that freedom and democracy will eventually come to Cambria, but such a revolution will take time, as it’s a war for the minds and ideas of people. As a new republic Sadathea needs time to build its forces. With part of the former Yarrow mercenary army defecting to Lancaster, Sadathea is now at deficit of its original forces. Additionally, there have been issues in trying to train and create military cohesion between the units of Yarrow and Wyndon, with the former not well trained in the use of Wyverns and the later not accustomed (or morally willing to) use, what is viewed as, dishonorable mercenary-style fighting tactics. So, as a compromised, leadership was split between the two armies to alleviate the natural growing pains and tension. Make no mistake, Sadathea can be a formidable defensive opponent, possessing a mighty fortress that was used to lure and entrap those bent on conquest for centuries. Irrespective, this new open society would much rather divide and conquer through ideals and politics rather than repeat the mistakes of Cambria’s past. As for magic, Sadathea avoids the use of magic and believes it should be strictly controlled from a central guild based in Bryn Mawr, a proposal not yet signed-off on by the other houses. The republic faces the prime issue faced by any new republic: their government of the people threatens the power structure of every single other civilization in Cambria. This would naturally make them a target but, unlike most new republics, Sadathea was founded as much by idealists as scoundrels. The House of Wyndon had an effect on the Brothers of Yarrow, showing them the way to revolution was not through arms but through belief. Whereas, the Brothers of Yarrow mercenaries had likewise an affect on the peoples of Wyndon, that one should never do something they are good at for free. So, ultimately the issues for Sadathea are internal, asking just how precisely does a ‘republic’ maintain its principles of democracy when profiteering off providing services to others often takes as much importance in the views of the elected leadership. Game Disclaimer: Sadathea will be at the center of the diplomatic sessions for Cambria, only members of the Sadathea team will be briefed on this unique arrangement pre-game. As a citizen of a new republic those from Sadathea may seek to wear clothing that exhibits their enlightened values. They tend to prefer to dress for their trade. A legal barristers cloak, medieval or 18th Century jacket, a tradesmen’s belt, a basic tunic, clocks, feather pens, anything enlightened that strays from excessive style of the royal houses. Additionally, citizens will always carry blank contracts and treaties to close deals with others quickly and officially. Why does Sadathea make other Houses nervous? The Republic believes in a natural law that a person is free before they are ever conceived, that freedom is a natural law to the state of being. This belief is one strongly founded in their ideological, political, cultural and even spiritual values and is a direct challenge the status quo and long-standing civilizations and cultures of Cambria. Not even the Elder Dragons and their Draconian warlords could ensure that every human remained in slavery, but there were few places for runaways to flee -- except the sea. Clan Gulph were originally the descendants of those that fled the Elder Dragons to the open waters, where they encountered various sea races. At first, they were merely a nomadic people surviving by fishing and learning from those who made the turbulent seas their home. However, over the centuries word of their sea-based civilization spread and more land peoples attempted to find the Clan (and many died trying to do so). 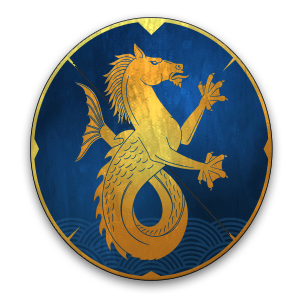 When word spread about the revolution against the Elder Dragons was taken up the Clan was one of the first to offer assistance by sea. However, Gulph has always been reluctant to define themselves as citizen of Cambria and have always proclaimed, over the objections of the land civilizations, that the laws of the realm do not apply to sea people. The Clan has evolved over the generations from first being a safe sea haven from tyranny, to crews of pirateers, to now a mercantile operation of unparalleled size. The original home of Gulph was majestic City of Sails, an urban landscape made of interconnected ships and fontillas. The City of Sails allowed the Clan to control their own destiny by traveling to any portion of the known world by sea. However, during the great Undead Wars Gulph managed to master the sea winds to create a city in the sky, powered by sails and connected to the ships at sea below through a complex system of pulleys. This sky city has been named Ilwe Manel and it offers affluent people from around Cambria gaming, trade, and entertainment outside the control of Cambria. From the perspective of a modern member of Gulph, true freedom cannot be found on land, true freedom can only be had at sea and in the sky. As the only pure seafaring people of Cambria, Clan Gulph will often collect precious items from the sea, such as rare shells and sea minerals to which land folk attach value. Trade brings them a good amount of gold that they tend to splurge on outlandish clothing. Land peoples view them a "fashionable pirates", to which Clan leadership takes as an insult. However, the Clan does have its share of pirates and sea misfits which are just too useful to not keep around. They are also a culture of sea sport, including boat racing and diving. Although they have access to the islands of the eastern sea, they prefer to live year round on their flotillas, employing the islands only to bury treasure, harvest or weather very large storms. The clan now operates a city of sails that navigates the skies, it functions outside of any laws, rules or regulations of Cambria and is known to be a location for gambling, black-market trade, and other “off the grid” dealings. Although Gulph has some precious items to trade, their main resource is there fleet. The seas of the realm are not friendly and only Gulph has been able to master them. Attempts by land peoples to master fleet-based seafaring have been met with disaster, there are simply just too many storms and threats lurking in the emerald abyss. Having sea-race people,such as half-fish people referred to as Deep Ones and Harpies at the top of the Guph leadership structure has been the key to their success, and the major houses of Cambria will pay handsomely for Gulph’s sea transport services. As a people who are constantly in motion, there are many beliefs among Clan Gulph. They are a superstitious lot – a fact which is driven by the capriciousness of the sea. In general, however, the peoples of Gulph follow an animistic bent – but they do not believe in the spirit of individual creatures or things. Rather, they believe in the spirit of groups of things – not a spirit of a fish, but the spirit of the school – there’s no spirit of a bird, but there’s a spirit of the flock. In fact, the interpretations of the movements of these spirits is how the shamans of Clan Gulph perform their auguries. It is through these divinations, and their ability with herbal medicines, that gives the shaman so much sway over a crew and its leaders. Clan Gulph reveres seas beasts, seeing them more as a kindred spirit rather than an object of worship. The sea is a harsh mistress. In the past, the Clan's human leadership survived through cleverness, perseverance, and camaraderie. Their small form of government organization was simply seen from within as a crew. However, when exotic sea races assumed control of the Clan a more top-down leadership structure was created. The leader is elected by a group called the High Bosuns. This group consists of only high ranking clan members who are of a sea race. Humans are permitted into the Clan but cannot achieve the rank of a Bosun. The High Kapitan is selected by a vote between the Bosun only. This leadership role will stay with High Kapitan for life, or until the Kapitan steps down or is voted out of the role by unanimous Bosun consensus. Clan Gulph does not have a standing army, however, they do have the largest fleet in Cambria and can deploy raiders on coastal targets without notice or warning to their targets. If a house gets on Clan Gulphs bad side it can make for a rough season. Gulph is infamous for enjoying the pursuit of various highjinx from the sea to frustrate and anger their enemies, albeit kidnapping a princess or blockading a port, Gulp has the freedom (and time) as free people of the sea to make difficult for those who cross them. The Clan freely practices magic from the sea races, a shamanistic form of magic that is little understood by outsiders. Their magic seems to have a variety of benefits and effects, from healing to changing the weather. Gulph has harnessed elemental sea magic that allows it to control its own course, but the magic is not so powerful that it could be used as a weapon of war or be a threat to the grander realm. Game Disclaimer: the members of Clan Gulph will be first out to sea and will have first knowledge of what has happened to the grand illusion that once divided the two continents, clan issues are now secret and only known to those in Gulph. The Clan do not like to be seen as "dirty pirates". The Clan prides themselves as sophisticated privateers who will carry items of the sea such as decorative shells and rare medicinal herbs and/or spices that are found of islands only Clan Gulph knows about. Seatools will also often be carried, such as compasses, nets etc. Those of the Clan tend to like decorative hats. Think less stereotypical pirate and more like fashionable sea merchants. The sea races are quite exotic and can take on various appearances, such a races inspired by the Deep Ones or Harpies. Why does Gulph make other Houses nervous? In continuing to deny that they are subject to Cambria international law and proclaiming they are their own independent jurisdiction makes the other houses nervous for a variety of reasons. First, Gulph will openly accept individuals with money, power and influence from the houses into their own clan, this can cause financial loss or a “brain drain” in the houses. Secondly, Gulph’s new city of sails in the sky runs its own casino and black-market economy that is essentially “off the grid”, both literally and figuratively. The other houses fear the effects of such a massive operation they cannot review or help control. Those of the Blood of Vermithrax are a warrior class society that still follows most of the traditions of their Draconian ancestors. They hold that not all Elder Dragons were evil consumers of magic, but rather that Elder Dragon societies are as complex (or more so) than human societies. As such, they worship Elder Dragons known as the Athair, Dragons that are not consumed with the desire to consume magic and are believed to be great leaders. However, they have never seen an Athair, as Elder Dragons have been long vanquished from Cambria. So, to outsiders, the Vermithrax seem to be worshiping beastly ghosts. However, Vermithrax holds that they are the one loyal and true blood of the Draconians. The Vermithrax desire to once again establish a homeland outside of the fire pits and will use both military might, and blood magic conversion of humans to Draconian to achieve this goal. Their continued presence makes the human Kingdoms nervous, and all sides have been seeking new lands to provide a solution to the problem on Draconian presence. Little was known about the Blood of Vermithrax for some time. This is because, following the revolution against the Elder Dragons, the Houses entered into a pact that all of the available books and records about the Draconians were to be locked away in the deepest chambers of Castle Bryn Mawr. However, after the Clan reemerged more was learned about them through political interactions and warfare. Vermithrax reside within the southern fire pits, a land uninhabitable by humans, only the Vermithrax know the network of subterranean cities in which they reside. The fire pits are also devoid of natural resources so the Vermithrax will often act as mercenaries for human houses in exchange for food and other resources that are found outside of the fire lands. ….For the Blood is life and life is the blood. For the life of a creature is in the blood, and I have given it to you to make atonement for yourselves upon My altar; it is the blood that makes atonement for one’s life. The Elder Blood is sacred. All those of Vermithrax’s Brood know it to be so. It is how they gain their power and how they maintain the right to rule; it is the central tenet of their worship. As such, before fledglings can take their place among those of the Blood of Vermithrax, they must first undergo the rite of the Dance of Sanguine Flames. Aided by the Priests and Priestesses of the Elder One, each fledgling is led down to the most violent and volatile rifts of the Fire Pits; it's here that they must walk (or dance) as the flames consume their bodies. If they are of strong blood, they survive and bear the scars of their Second Birth. If they do not, well, Vermithrax never coddled the weak, and the Brood is better off without them. Blood is everything to these Draconians. Those once favored by the Elder Dragons, such as Vermithrax, often find their descendants in positions of power. Those who can both prove lineage and command the Elder Dragon blood that flow through them often have the power in the Clan. However, blood lineage is not necessarily everything, and it is not uncommon for Draconian positions of power to be hotly contested, and for Draconians to fight over the right to prove one’s “Blood”. Vermithrax does not have the volume of soldiers to match the human Houses (as to birth and mature a Draconian is a far longer process than that of a regular human), however the forces they do have are extremely powerful as one soldier is considered the equivalent of possibly 10 humans. They also have some limited battle magic but tend to pride themselves as knights wielding steel weapons forged from the fire pits. Human houses covet their warriors as mercenaries. Game Disclaimer: the issues facing the Draconians in the next Dragon Thrones is secret and will only be revealed to Draconians players. Scales / horns are up to each player and are not mandatory. Masks are even applicable to Vermithrax as they range range from Human-Like Draconian, to Human-Like Dragon! Why does Vermithrax make other Houses nervous? Vermithrax makes all of Cambria nervous for the same reasons they always have and will: what if one day these half-dragon half-human knights see a window of opportunity to re-take all of the realm and rule once again? Or, worse, what is an Elder Dragon were to arrive in Cambria, it’s possible that Vermithrax would worship it. Currently, there is a peace between the Vermithrax and the humans as Vermithrax has agreed to follow the international laws of Cambria and is currently in a federation with Ashbridge. However, should this relatively peaceful balance of power become disrupted a militant Vermithrax would cause most humans in the realm to lose a lot of sleep. The Ashbridge Draconians are unique among the their race, as their philosophy is formed by their famous founding member-- Gitrix. She sought alliances with humanity and believed that that eternal slavery to the Elder Dragons was no place for the humans they ruled over, as the Elder Dragons were draining the life energy from Cambria which would doom all, human and Draconian alike. Thus, upon the end days of the revolution those Draconians who followed Gitrix's message fled to the desert lands and formed their own unique culture, free from strict Draconian traditions and human threats to them. More magically inclined than their Vermithrax kin Ashbridge prefer political solutions first but they will defend themselves fiercely if necessary. 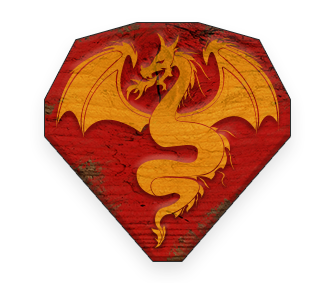 Ashbridge scored a political victory by having Vermithrax leadership to agree to form a Draconian Federation thereby stabilizing the Draconian regions. Presently, Ashbridge are known as the great healers of the realm and have established temples where they practice Draconian healing magic. They will also exchange in trade with humans, offering exotic items of their desert. The Draconians of Ashbridge have customs that mirror and emanate from the unique conditions of the desert in which they reside. They are very careful to share their culture and knowledge, as they understand very well where an abuse of what is powerful can lead a civilization. However, the Clan will very welcoming and open to those who earn their trust. To the few outsiders who have traveled the Zareen dessert reports are of an exotic culture, with cities built at and around oasis, where unique rituals are practiced and the movements of Cambria's moons are tracked closely. The Clan lives freely deep within the vast Zareen desert to the southwest, a climate that human expeditions avoid due to the temperature and sand storms. Their capital city is called Nakul, which is a network of temples and towers built of lime and sandstone. The resources of the desert are unusual and varied. Gems, healing stones, silks and fabrics are often traded by the Clan with outsiders. The Blood of Ashbridge are not inclined to the worship of cElder Dragons like Blood of Vermithrax. The worship the moon and the stars and believe their is a spiritual force that permeates all living and magical things, which they call Maisata. The believe that Elder Dragons either fall into two categories, lawful good or lawful evil, but dragons themselves are not gods and true spiritual awakening is when one becomes one with the universe, something those in Ashbridge believe they can only sense as they are themselves the combination of two different lifeforms: human and dragon. Those of the blood see themselves as the natural successor to Gitrix, and have seen themselves that way for generations. Like Gitrix, they believe ultimately in peace instead of war. The inner workings of the Clan reflect this devotion to peace - although they do have a High Ruler that ruler answers to a Council of governors who advise on all matters public and political. The ruler is chosen by the governor, and the role is chosen for life and can only be ended through death. Ashbridge does not have a typical standing army. Similar to Vermithrax they have less units that the humans Houses but their units are more powerful. 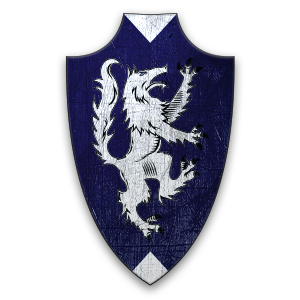 Whereas Vermithrax is known for their Draconian knights, Ashbridge is known for their brave and powerful battle mages. Why does Ashbridge make other Houses nervous? The main concern over Ashbridge is there is allegedly a group of battle mages that believe Ashbridge should strive to be more powerful in the realm through the use of their magic might. These young mages are the only of their kind in the known world and, unlike their more tempered leaders who strive for balance in Cambria, these younger battle mages are rumored to believe that they are destined for something far greater than the life of a desert shaman, healer and trader. They believe their powers can be that of legend. All website content, story, characters, and game designs are (c) 2017 - 2019 The Game Theatre, LLC. 'The Game Theatre' is a licensed TM. 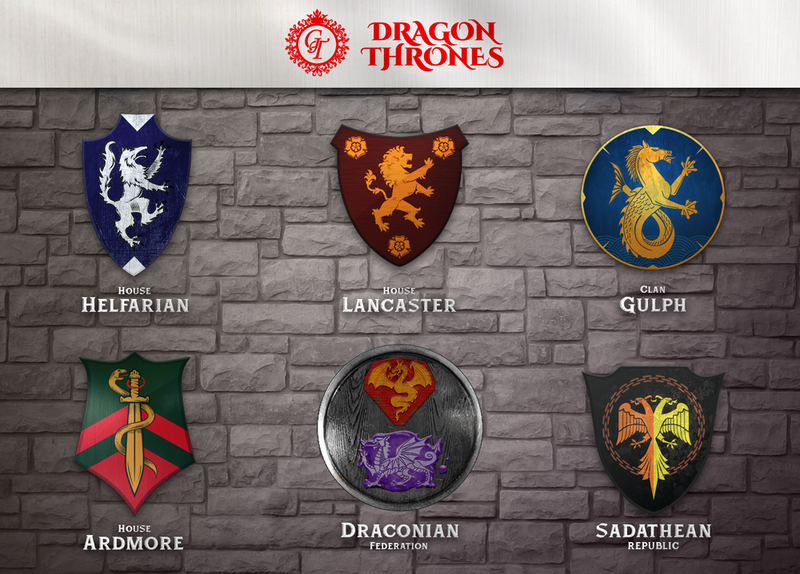 'Dragon Thrones' and the ‘Mirror Mission’ Game System is both (c) and TM of The Game Theatre, LLC. All Dragon Thrones content is original creative property of The Game Theatre and does not appropriate any third-party content.